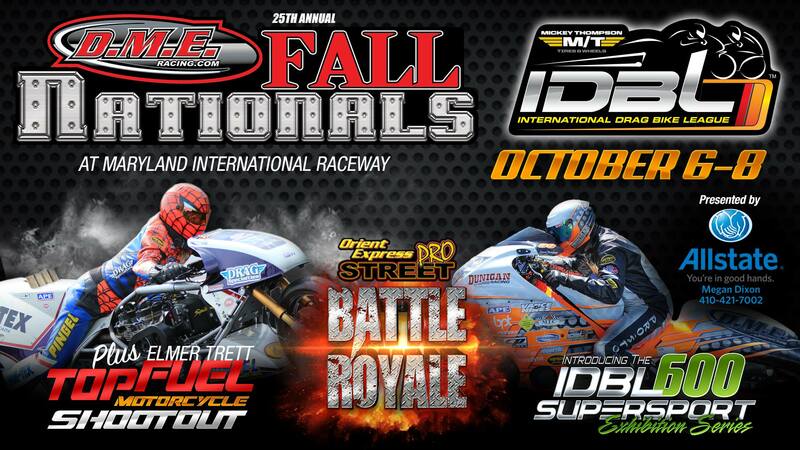 The excitement continues to build for the upcoming IDBL DME Fall Nationals from Maryland International Raceway, Oct. 6-8, where world records could fall. 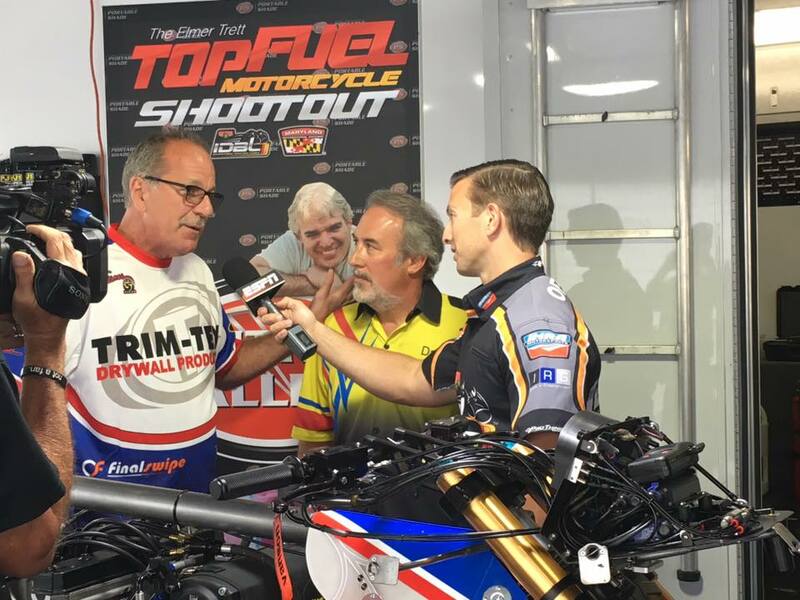 Top Fuel Motorcycle fans were treated to a show for the ages at the IDBL Bike Fest at Maryland International Raceway, July 28-30. In his more than four decades of racing, legendary Top Fuel competitor Larry “Spiderman” McBride has never produced a quicker or more consistent weekend. In total, the Spiderman laid down three runs in the 5.70-zone and one in the 5.80s, including his career best of 5.74. 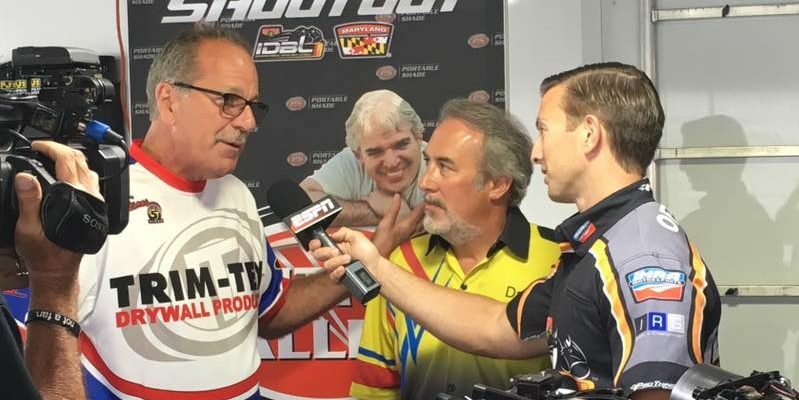 Larry “Spiderman” McBride and Dave Vantine talking about their epic IDBL weekend on ESPN. Fans who stuck around and endured a day-long rain delay Saturday, July 29th were rewarded handsomely in the evening. McBride and talented rival Dave Vantine blasted down a freshly-prepped MDIR racetrack and posted a sensational side-by-side five second run – only the second time the feat has ever been accomplished. McBride and Vantine are the only two to have run a side-by-side five, with the first coming in 2014. Dave Vantine and Larry McBride blast off and produce an historic run. It has the 16-time champion and his talented colleague looking forward to what they could potentially accomplish at their next stop at Maryland International Raceway, Oct. 6-8. 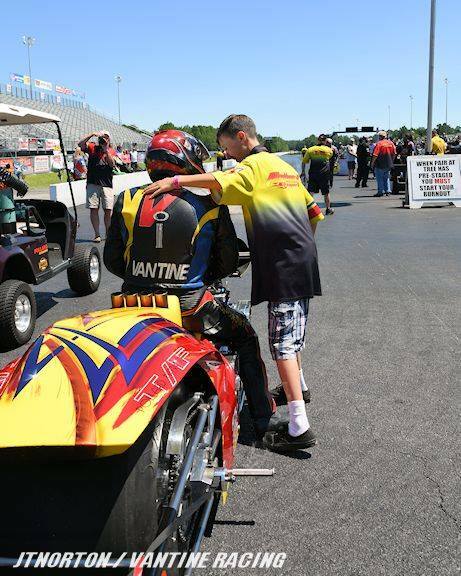 The annual race usually brings record-setting weather to the already record-smashing dragstrip. McBride’s 5.74 represented the quickest run in the nation and the second quickest run of all-time, behind Sweeden-based racer Peter Svennson’s 5.70. Vantine crossed the stripe with an impressive and near-career best of 5.81. Astoundingly it was the first run of the weekend for both competitors, with no prior testing. It was also the quickest run of McBride’s long career, which started in the dirt on a Suzuki T500 1975 more than 40 years ago. Watch what the pass means to McBride’s crew and colleagues in the post run celebration in this video that has been viewed more than 700,000 times on the Cycledrag.com Facebook page. McBride did not even plan to make a full pass. He said it felt too good to lift and the thrill of beating Vanitne to the finish line was something the competitive veteran could not avoid. Vantine says he could not have been prouder of his mentor and coach. McBride was equally excited for Vantine’s team. 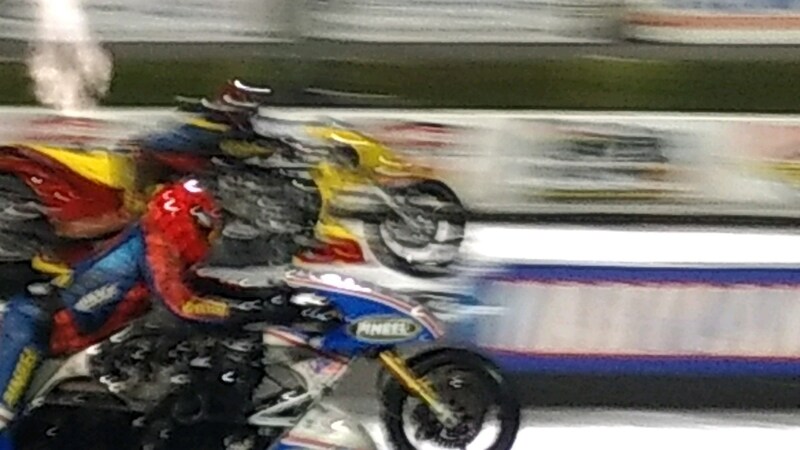 The 5.741 surpasses McBride’s previous best of 5.746 on his former motorcycle “Blue” from 2010. “It’s hard to put it into words how much this means,” said McBride, who nearly ended his career in a fiery explosion in 2015. 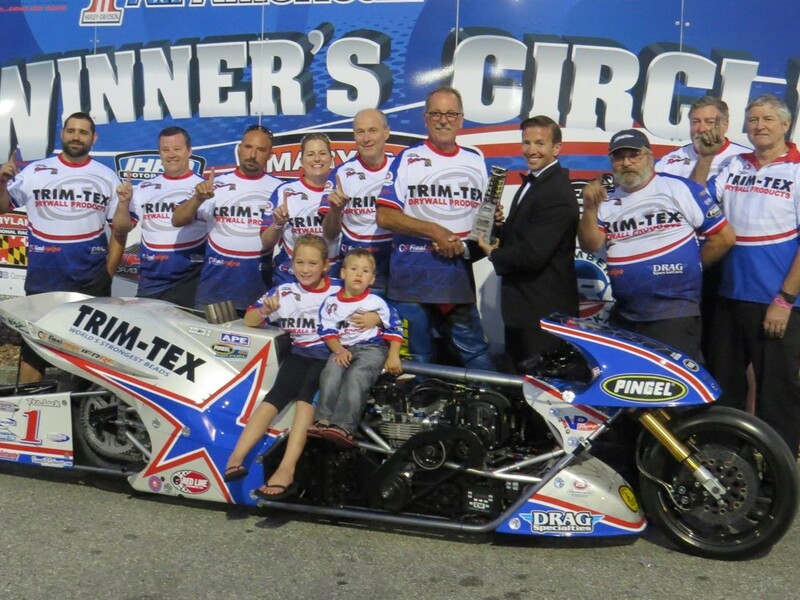 McBride attributed the performance to hard work by his team and help from sponsors and Top Fuel expert Bill Miller. “All the new fuel system stuff is coming together,” McBride said. Giving fans even more optimism for the Oct. 6-8 race at Maryland International Raceway, McBride says the 5.74 was not a flawless run. 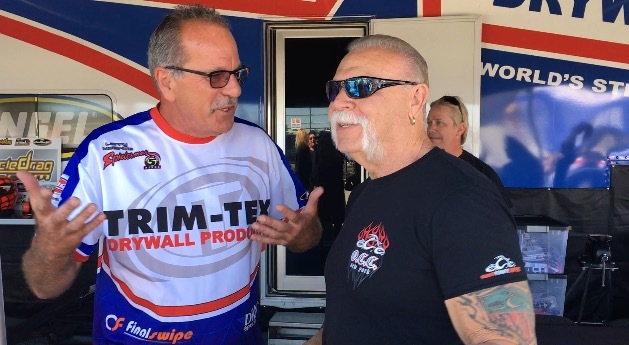 McBride got to do it all in front of hundreds of friends and family, including primary sponsor Joe Koenig of Trim-Tex and his old pal Paul Teutul Sr. from Orange County Choppers. Larry “Spiderman” McBride, and Paul Teutul Sr. of Orange County Choppers. Perhaps no one was more excited than McBride’s crew chief and brother Steve. After each run Steve entertained the crowd and expressed his satisfaction with several wall climbs and fist pumps. McBride loves seeing his brother adrenalized. McBride praised his crew, including Roland and Chuck Stuart for all the hard work. McBride has always talked about wanting to make a run in the 5.60-zone. With his 5.74 only four-hundredths away, the possibility seems even more plausible. 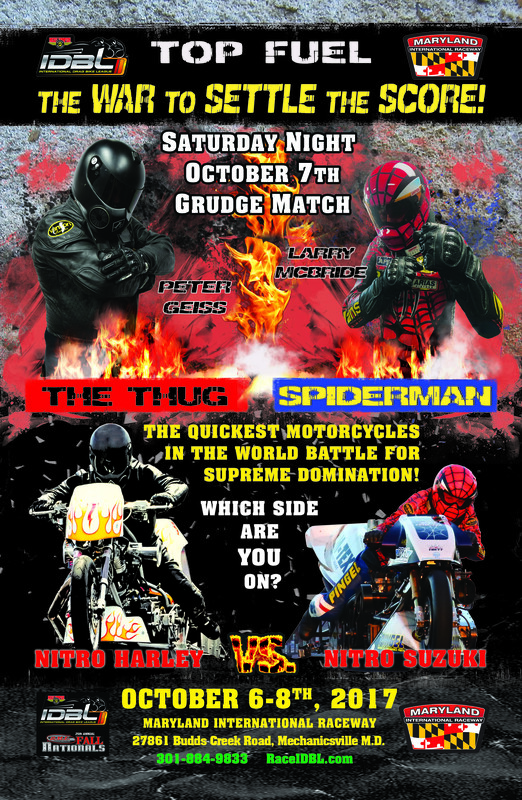 Spiderman fans hope to see the much-anticipated number flash on the Maryland International Raceway scoreboard, Oct. 6-8. McBride says it will be another fierce battle between Team McBride and Team Vantine. Adding to the excitement, McBride was called out for a special Saturday night grudge race against Trim-Tex Nitro Harley points leader Peter Geiss.